Back from the Paperback Tour! Paperback Edition — and a New Cover! I’m getting ready to head out on tour on May 1st. I can hardly believe it. I mean, it’s one thing to have your book available for people to read, but to talk with a group of folks who’ve read or are about to read it – it’s just too good. Most writers write, I think, because they want to connect. This one does, anyway. But previous to this year, I never envisioned being able to connect with readers through any means other than through the book itself. 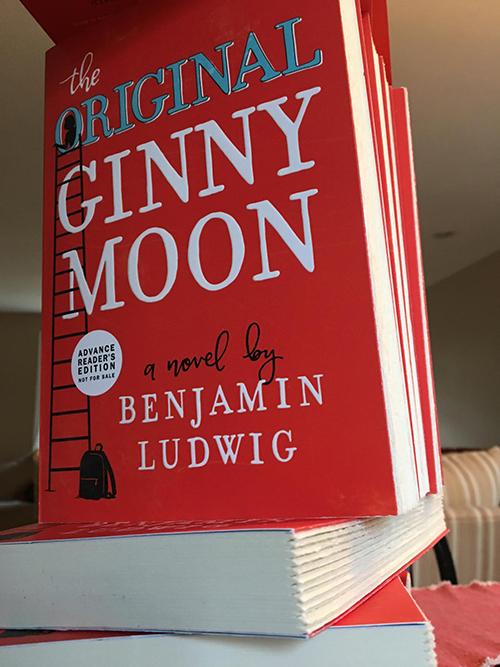 In other words, I never thought my relationship with readers would extend beyond the experience of people simply reading Ginny Moon. After all, that was sort of my fantasy, growing up: I wanted to write books that people would fall in love with, because I had fallen in love with so many books myself. So I’ll be visiting 15 different cities between May 1st and June 2nd. The list of stores and locations is available on my website. If you happen to be nearby when I’m in town, please stop by. I’d love to say hello. Earlier this month I went to Washington DC for AWP’s annual conference. For those of you who aren’t familiar with AWP, it’s the Association for Writers and Writing Programs. The trip was scheduled just a few days after I returned from Toronto, so it was hard to get back onto a plane again – but it sure was worth it. I met with some writers who I’ve been meaning to connect with for a long, long time, and talked about my next book with my agent. I attended panel discussions on flash fiction, editing a literary magazine, and a host of other topics. I attended the event with my friend Russell, whose work recently appeared in Subtropics. The journal also published a super interesting interview with Russell as well. But Russell, aside from being an incredible writer, just doesn’t dig technology. Over lunch, when his sister started texting him on his wife’s phone, he decided to send his very first text. I had to snap a picture to commemorate the moment. Here he is, charging boldly into uncharted territory. The most important part of the conference, however, was finally meeting Diane Zinna from Writer to Writer, a mentorship program that I wrote about here, and that my good friend Colette wrote about here. The two pieces offer very different (but both extremely positive!) views on the program: one from the mentor’s perspective, and one from the mentee’s. Folks, if you’re in an MFA program, or thinking about applying to one, or if you’re a writer who wants to engage with other writers about your work, please, please, please consider applying to Writer to Writer. The work that Diane does, connecting writers from all walks of life, is not only brilliant, but life-changing. Information about applying is available AWP’s website. Colette and I participated in the program in the spring semester of 2016. I hope to give it another go in the fall. Here I am with Diane at the Writer to Writer reception. And here’s a picture of some of the other mentors and writers, all together. Diane of course is front and center in the photo. Really can’t wait to serve as a mentor again! This past week I flew to Toronto to visit the Park Row Books office and the HarperCollins Canada office. Both places put together magnificent receptions. I was interviewed, did a FaceBook Live event, and got to talk to a lot people, everyone from the cover artist to the proofreaders who worked on the book. And there were readers there, too, which was super exciting. HC Canada put out invitations to non-HC folks, so there was quite a crowd. We talked at length about the two issues raised in Ginny Moon that really drive me, both as a writer and as a person: the significance of voice, and human dignity. Here are some links to videos of the event. And somewhere between the two receptions, I attended the Ontario Library Association’s Super Conference, and signed lots and lots of books. It was the first time I’d ever been to Canada. I was in awe of the place. Everything about it was excellent: the cleanliness, the pride that people took in their streets and shops, and the friendliness and helpfulness of the people. It was all so, so good. I’m ready to visit again, but you can bet I’ll bring my family next time. Just last week I was in Atlanta for the American Library Association’s Midwinter Meeting. When I walked in I was greeted by a very large sign, so I stood next to it and asked my editor to snap a picture. As if the day couldn’t get any better, I met one of my favorite YA authors, Kwame Alexander. He was signing on the other side of the booth from me. I was only in Atlanta for a day, but it was one of the best days I’ve ever had. Incredibly insightful, incredibly informative, and incredibly fun. Librarians are some of the BEST people on the planet. Went to my parents’ house for Christmas dinner, and they had the woodstove going. The woodstove used to be ours. We moved this past summer to a house that had more space. It doesn’t have a woodstove at all, just an oil furnace. I’d been heating with wood for eight years, up to that point. I really loved heating with wood. It was a different lifestyle, one that felt more connected. The work involved in cutting down your own trees, splitting, stacking the logs – it’s all intensely physical and extremely satisfying, especially when the power goes out for three days and you can tell people hey, come on over, we have plenty of wood and heat. But like I said, our new house has an oil furnace, so we gave the woodstove to my mom and dad, who’d just purchased an old 1800’s farmhouse up north. They put the woodstove to excellent use, and yesterday at Christmas dinner I sat in front of it as it blazed and blazed. I didn’t think I’d miss the woodstove quite so much when we moved, but now I know I do. In moving into the New Year, I hope to continue seeking out connections, ones that offer their own heat and light, as well as the reassurance that comes from having stacked a season’s wood against the coming winter. December is an odd month for my family because we have three birthdays to celebrate. My wife’s, my youngest daughter’s, and my dad’s. Plus, you know, Christmas. So it’s busy. Add to that the fact that our oldest daughter is moving all of her things out this month, and the business travel I have to do in January is starting to look like a vacation. 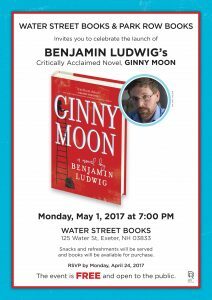 I’ll be in seven cities talking with book people about The Original Ginny Moon. I didn’t think that, as a writer, I’d get the chance to talk so much. I thought being a writer was all about the writing. And it is, when I’m working on a draft. But there’s always an idea that drives the writing. In the case of The Original Ginny Moon, the idea is adoption. Next month I’m going to have the chance to talk with a lot of people about what made me write the book, and that means I get to tell them how much it means to have had the privilege to adopt. Yes, it was a privilege. Because a lot of people love the idea of adoption, but just aren’t in a position to do it. Maybe they have plenty of room in their home, but they work long hours. Or maybe they’re already taking care of multiple children or a parent. Whatever you have going on in your life, it’s probably a lot. But my wife and I were in a position, right after we were married, when we didn’t have a lot going on. We wanted children of our own (and ended up having two fairly quickly), but both of us had always, always wanted to adopt too. Why wait? We couldn’t think of a single reason. And like I said, it’s not every day that a person is in a position to do that. Families are hit with major events all the time. But I want everyone within earshot to know that we gained a ton from the experience. We learned from all the classes we had to take, everything from the effects of childhood trauma to raising teenagers. We met and formed powerful relationships with foster parents, social workers, and therapists – even our local fire chief. Most importantly, we had to learn how to work together in ways we never expected, acknowledging our differences and strengths as a couple, and learning how to cope with our own shortcomings. And as if that wasn’t enough, we gained a daughter in the process. The young lady who we adopted as a young teenager is twenty years old now, and (as I said earlier) moved out of the house. Her journey became ours, and all of us are better off because of it. My wife and I hope to adopt again someday, too, probably after our three-year-old is in school full-time. We’ve got an empty bedroom now, and we’re not so great at leaving those empty. So I’ll be traveling soon, and I’m super eager to talk with folks about this topic. It means a ton to me to have been able to adopt, and to share the experience with others. Our adopted daughter’s empty bedroom. Very glad you stopped by. I hope to use this space to share news – book news, and of course personal news as well. At some point during this past year those two things became almost one and the same. I’m still reeling from the merger, you might say. Just last week a big box of ARE’s (Advanced Reading Editions) arrived in the mail. The ARE’s are beautiful. They look like the real-deal, and are the last step – the almost-final-draft, if you will – before the actual book comes out in hardcover in May. Meanwhile, my publicist is setting up events. We’ll be headed to Atlanta for the American Library Association’s Midwinter Meeting in late January, then to Minneapolis for the American Book Association’s Winter Institute, and finally to Toronto for the Ontario Library Association’s Super Conference. After that I’ll be in Washington DC to attend the annual AWP conference (Association of Writers and Writing Programs). I hope to blog as often as I have updates and insights, which these days is pretty frequently. I’ll be sending out a newsletter, too, so I hope you’ll subscribe.